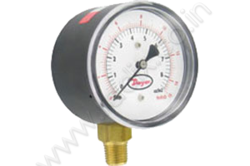 Providing you the best range of stainless steel low pressure schaeffer gauge, dial thermometer gas filled temperature gauge, pressure gauges, compact size gauge, spirahelic direct drive pressure gauge and tridicator gauge with effective & timely delivery. 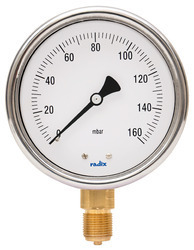 Radix manufactured Pressure gauges are specially designed fot the optimal solution for the widest range of applications, there is a choice of measuring systems in Bourdon tube, diaphragm element and capsule element technologies. 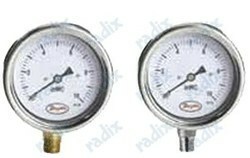 These Pressure Gauges are designed for various requirements in industrial and process instrumentation there are pressure elements in copper alloy, stainless steel or special materials available. 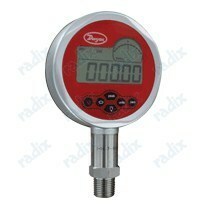 Indication accuracies of up to 0.1 %. 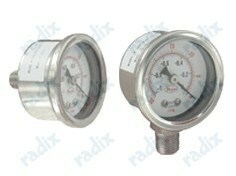 The Series SGO Gages have dual English/metric scales with ±1.6% full scale accuracy. 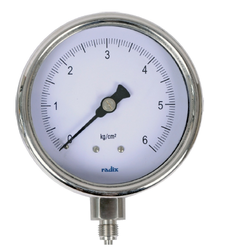 The Series SGO gages are designed with 304 SS housing, a 316L SS chamber and PTFE coated diaphragm for excellent chemical compatibility. 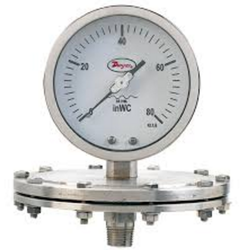 Units can withstand ambient temperatures up to 149°F (65°C) and process temperatures up to 248°F (120°C). 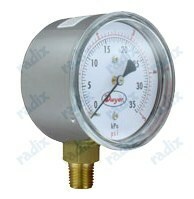 Ranges are available from full vacuum, compound to 300 psi. Service: Liquids & Compatible gases. 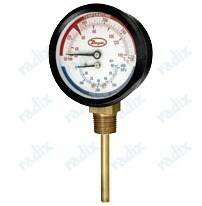 The Series TRI2 combines the value of an individual pressure gage and thermometer in one instrument. 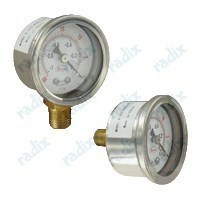 These tridicators simplify installation which reduces time and saves money. 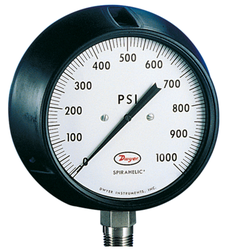 The moveable dial with blue pressure markings and red temperature markings make the instrument easy to read.Pressure is indicated in both psi and kPa, while temperature is measured in both Fahrenheit and Celsius. Series TRI2 comes in three different connection options including lower mount, center back mount, and center back mount with extension shank. Weight: 4.9 oz (141 g) bottom, 5.8 oz (164 g) back. Add 3.7 oz (104 g) for glycerin fill. 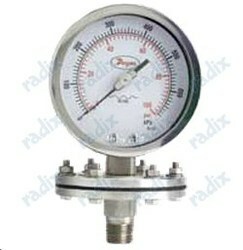 SERIES Mark II Molded Manometers are of the inclined-vertical and inclined types. The Model 25 is excellent for general purpose work. 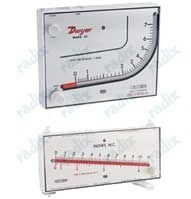 The Model 40 inclined gage provides excellent resolution throughout its range & linear calibration.The Model 40 is ideally suited for air filter gage & air velocity applications.